Place ribs in stock pot. Add enough water to cover ribs. Bring to boil; skim foam from surface. Add onions, ginger and 2 Tbsp. rice wine; cover. Simmer on medium-low heat 1 hour. Remove from heat; let stand 15 min. Transfer ribs to large shallow dish; discard cooking liquid. Mix next 5 ingredients and remaining rice wine; pour over ribs. Refrigerate 8 hours to marinate, turning occasionally. Heat greased barbecue to medium heat. Remove ribs from marinade, reserving marinade. Grill ribs 20 min., turning occasionally. Brush with reserved marinade; grill 10 min. or until golden brown, turning occasionally. Marinate boiled ribs as directed. Remove from marinade; reserve marinade. 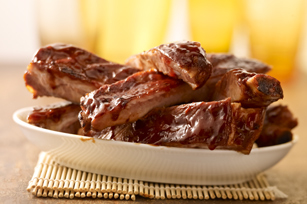 Place ribs in single layer in shallow foil-lined pan sprayed with cooking spray. Bake in 350ºF oven 30 min. Brush with reserved marinade; bake 15 to 20 min. or until golden brown. Ribs can be marinated overnight before grilling as directed.